I’m on Your Cheerios Box! That’s right, go ahead…take a looksy…look a lil closer…do ‘ya see me? 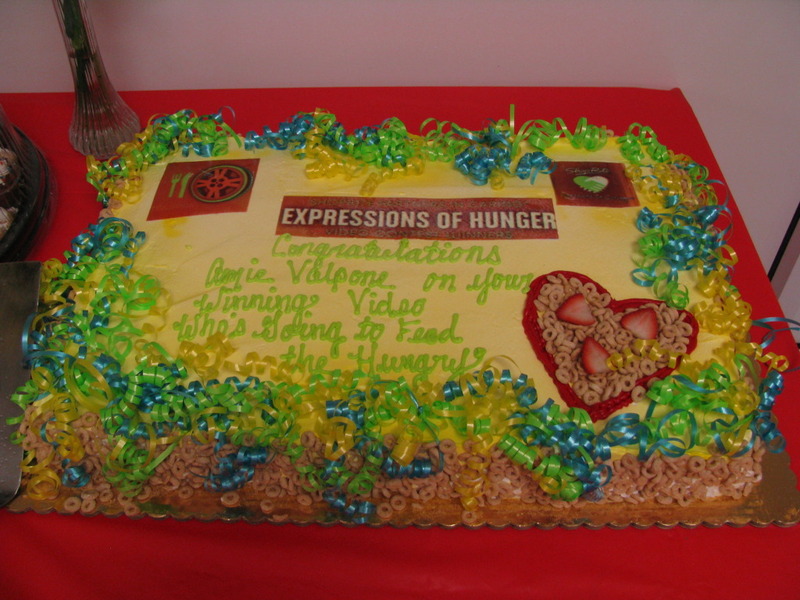 I recently entered an Expressions for Hunger video contest, where I submitted a video of myself reciting a poem about the fight against hunger…and what do ‘ya know…I won and I’m now on the back of your Cheerios box. So go ahead, take the box away from your kiddies as their eating breakfast and take a gander at my pic! I had such an amazing time at the Cheerios photo shoot, I was jumping around the entire day and loved all of the excitement. 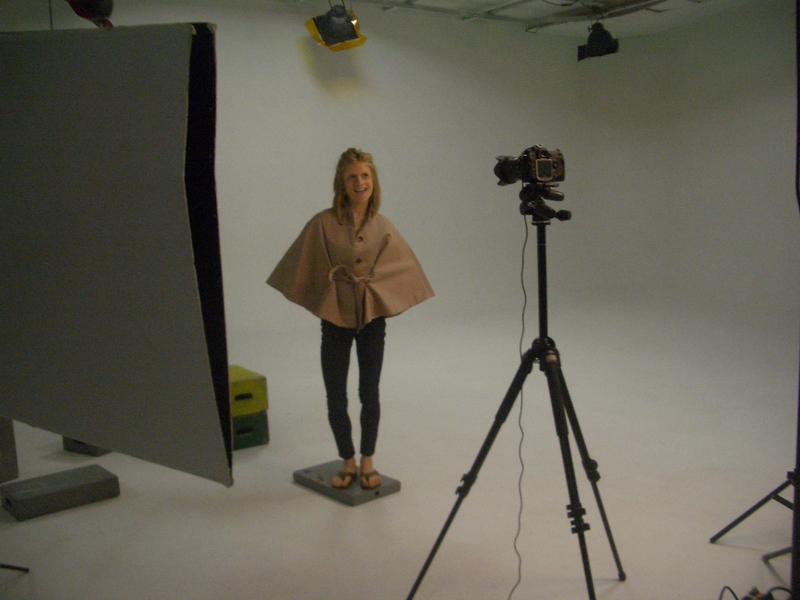 Here’s a lil sneak peak at some of the behind the sceens footage of me, myself and I at the Cheerios Box photo shoot! Get on over to your nearest Shop Rite and pick up a box of Cheerios to take a looksy at my picture and the Expressions of Hunger contest. 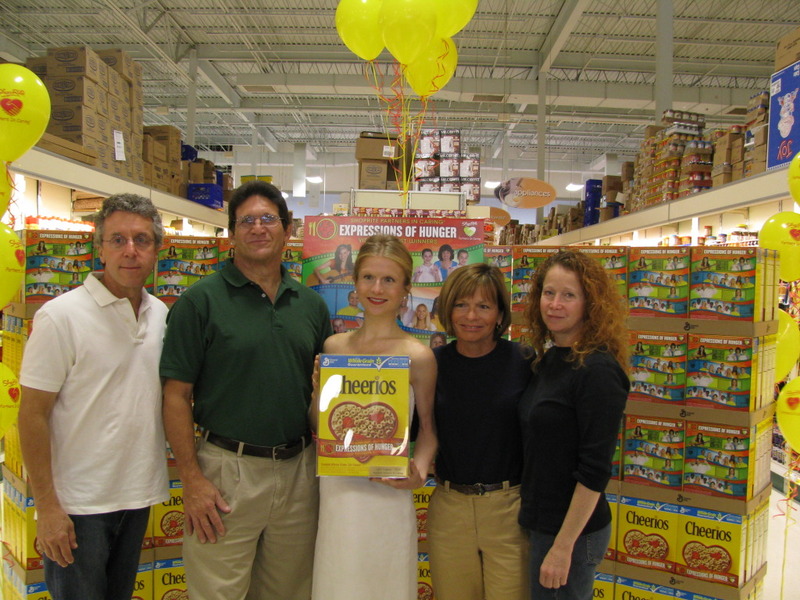 Cheerios hosted a beautiful ‘Amie Valpone Cheerios Box Unveiling’ Ceremony where I was greeted by the Cheerios team, General Mills corporate, local newspapers and my family (of course). 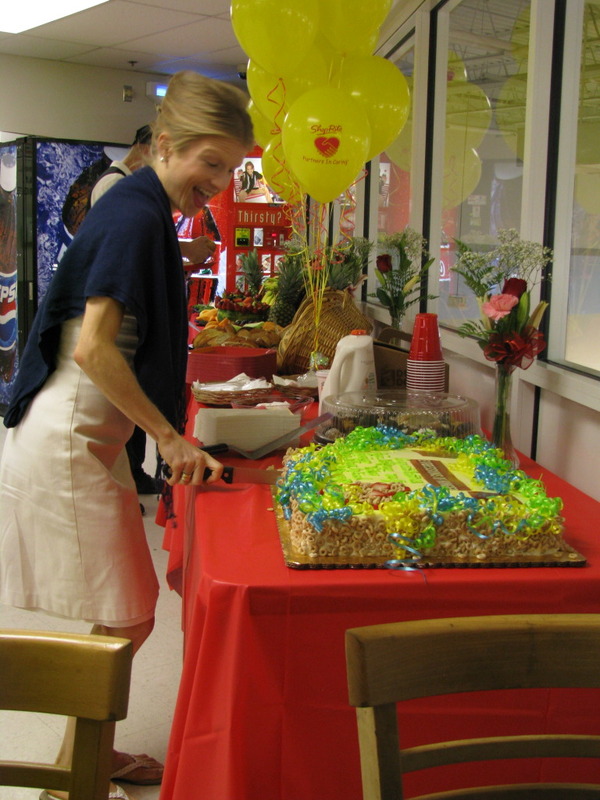 They created a fabulous ‘Cheerios’ cake and had a delicious spread of breakfast for my family, friends and myself. Cheerios also presented me with a Cheerios plaque and my very own Cheerios box in a beautiful case. I guess this will just have to go up on the shelf with my high school soccer and lacross trophies, which are well on their way to collecting dust, hehe…am I really that old already? Wow, how time just flies when you’re havin’ fun..
What were some of your favorite foods from growing up? Did they create fond memories for you, too? I leave you with this photo of me, of course, cracking up when I first saw myself on the face of the Cheerios box. Enjoy! I’ll be picking 10 Winners to receive a bag of Mini Larabars. 1). Tell me your your favorite Larabar flavor. 2). Post this giveaway on your blog. Leave a comment telling me you did. 3). Tweet this Giveaway post! Leave me a third comment telling me you did. Each comment counts as an entry. Good Luck; I will be picking a winner on Friday, September the 17th at 5PM EST. And, be sure to check out the Hershey Center for Health and Nutrition Moderation Nation website, which launches today! It’s a program that features a host of new tools and resources to educate people on how to achieve balance through moderation, both in nutrition and physical activity. I am a HUGE fan of the peanut butter jelly flavor! mmmmmmmm. You look so great on the Cherrios box. I’m partial to the Cherry Pie Laras. And I love that mini size. I’m still laughing at the irony of a non-cheerio eater wining their contest. Kudos for entering and I’m glad you enjoyed yourself. My favorite is Cherry Pie for fruity and Chocolate Chip Cookie Dough for chocolate-y. Congrats! That is so exciting! I will search for the box next time I am in the supermarket! Favorite flavor is the Peanut Butter Larabar! My fav LaraBar is cashew cookie. Hrm. Cashew cookie would have to be my favorite! How cool on the Cheerios gig!! Congrats. I’ve only tried a few flavors so I’m going to be a rebel and let you know what I want to try – the carrot cake. Definitely the choc chip cookie dough. Just tweeted your give away and will be adding it to my blog in the next hour. Have a great day! I can’t possibly choose a favorite! They are all so delicious!! But, if I really have to decide then I would pick Peanut Butter Cookie. SO good! Congrats on being on the Cheerios box! OH MY GOSH, that is so cool! congrats! i bet you are so proud of yourself 🙂 are you going to foodbuzz this year? i sure hope so! p.s. favorite flavor=coconut cream pie. my favorite is apple pie!! You are FAMOUS!! I will get a box now and save it for when Anna can eat Cheerios and then I will tell her all about you on the box!!!!!!!!!!! Excellent news – I look forward to find you on a box of Cheerios. What a great experience. As for Larabars, Cashew Cookie was my favorite until today, when I tried the Peanut Butter Cookie, which is just delicious. I am new to Larabar land and Cashew Cookie was the only one I ever tried. I want to try the Peanut Butter one everyone is raving about! *Congratulations* on your Cheerios win — I enjoyed all the photos 🙂 My favorite is LÄRABAR Lemon Bar 🙂 *Thanks* for the giveaway! I like the cinnamon roll lara bar, but am definitely intrigued by all the other flavors everyone is listing here! Oh my tough call! I think the lemon is my favourite, but all of them are SOOO good. Perfect before a big run! Congrats on the box! That is so neat! The Peanut Butter Larabar is my all-time favorite! I’d have to say the Peanut butter cookie is my favorite flavor. It never get old! PB & J is a close second though. Love love love pretty much any flavor. But if I had to choose one it would be the coconut cream pie too! Congrats on the cheerios box! Thanks so much for the congratulatory wishes, Raquel! Have a great day! My favourite larabar flavor is peanut butter cookie and apple pie!!! Chocolate chip cookie dough Lara Bars are the best…hands down. Anything that resembles cookie dough, and can do so in a healthy way, is a definite score in my book! My fav is the Tropical! I can’t believe you’re on the cheerios box! Congrats, you’re a celebrity now!!! I loooove banana bread larabars, they might be my all time favorite food! Congrats on Cheerios. That’s exciting. For my favs, it was PB Cookie until I recently tried the new flavors and fell in love with the PB Chocolate Chip… delicious! Love the mini sizes, they need to be available for all flavors! Congratulations! You are immortalized!! How cool! As for the Larabar’s, I love them all but the peanut butter and jelly is really my favorite..I know it sounds boring but it’s so good!